Hakkvild, former Jarl of Falkreath who freed the hold from the hands of Yashmag's Orcs, built himself this spacious hall on the heights above town, with convenient access to the crypts of his ancestors. And now it can be yours! 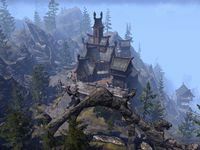 Hakkvild's High Hall is an expansive Nord manor reachable from Craglorn. It is accessed via a small crypt, with a tunnel shortcut that leads to the main hall, or you can exit the catacombs via the main doorway and cross the large courtyard to the hall. The hall itself is a large, round room with a cross-shaped foyer. There are balconies above the main hall, one of which can be accessed via a doorway in the archway connecting the main room with the foyer. The other balcony is inaccessible, but can be reached by building platforms connecting them. The hall is surrounded with a covered wall overlooking the inaccessible town of Falkreath, with towers on either end. The southern tower has stairs to access the upper level, while the northern tower has only an interior room on the ground floor. To purchase this house with gold, you need to complete the Room to Spare quest and Horns of the Reach Delver achievement. Although the manor is accessed from Craglorn, it is actually located in Falkreath Hold in Skyrim.